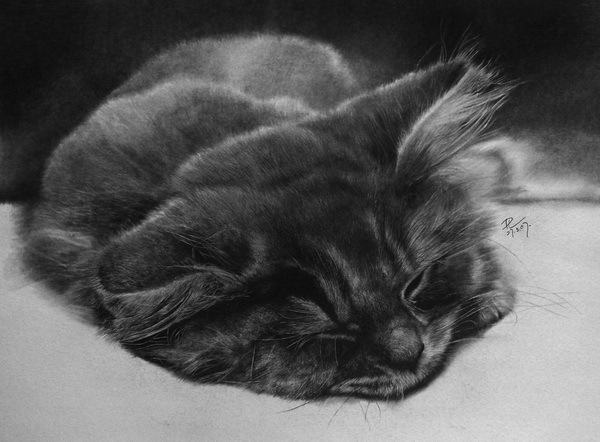 It’s hard to believe but all these beautiful pictures are not photos but pencil drawings. The author of such unbelievable art is 38-year-old graphic artist from Hong Kong Paul Lung. 0.5 mm technical pencil and A2 paper are the only attributes of these masterpieces. He doesn’t use eraser and spends up to 60 hours sketching out his pictures. As he often admits people do not believe him and he has to make videos of his work to prove that these art works are not photographs. Check these beautiful artworks by yourself. UPDATE: Due to the increasing number of comments from our readers who doubt in real belonging of these images to the works of Paul Lung – we’ve contacted with author of these art works. Rather Paul Loong himself contacted us and explained that not all of art works were placed in its portfolio on devianart were really his work. How it was happened – Lung did not explain, but we have edited our post, and now our readers can be sure – all the works featured on this page are indeed the real work of Paul Lung. Art and unbelievable design come together with Elliman’s luxury Brooklyn homes. Take advantage of cheap printing services only at PsPrint.com.